College memes are suddenly invading the Facebook streams of students at schools throughout the U.S., Canada, and parts of Europe. As The Cherwell, Oxford University's student newspaper, explains, the meme is "an idea or behavior that spreads through a culture by imitation. Internet memes follow this principle, humorous images are copied and re-captioned, concisely describing or satirizing the activity of an individual or group." Building on its burgeoning popularity in recent years on sites such as Reddit and 4chan and via viral creations like LOLcats and Rickrolling, the Internet meme has been rapidly and rabidly adopted by undergraduates since the start of last week. A rash of student media reports and social media chatter confirm that undergraduates' online experiences are now hovering between "meme madness" and full-blown "meme mania." Last Friday, Syracuse University sophomore Bob O'Brien tweeted, "The 'College Meme Page' frenzy is unlike anything I can remember on Facebook. Seems every school is discovering it at once." In a recent post, the University of Iowa online student outlet The Hook Up similarly stated, "It's not often that such a phenomenon takes off running with such fury and so little impetus ... Students are now meme-ing like they've never memed before." recognized campus groups. Instead, they are the efforts of individual students or small groups of friends who have no ambition other than sharing a laugh and getting their peers' attention. Memes, Y U So Addicting?! Early last week, in a story headline that mimics a popular meme conceit, The Daily Illini asked, "Memes, Y U So Addicting?!" Dozens of campus newspaper articles indicate student readers enjoy the ease with which they can scroll-and-scan others' memes and quickly create their own. They are also fond of the incredibly high levels of interaction the Facebook pages foster. As one of the founders of a Northeastern University memes page told The Huntington News, "[T]here have been people posting on it pretty much non-stop, like all night ... I was actually kind of afraid to leave my computer for five minutes. I came back and there were like 300 new likes." Students especially like the sarcastic references about campus rivalries, bad cafeteria food, and crappy parking that only their schools' students, staff and alumni can fully appreciate. To that end, a University of Minnesota journalism professor calls the memes exercise "one big inside joke." Yet, the college memes generated so far also touch on many rites of passage universal to undergraduate life, including crazy classes, registration woes, partying, drinking, road trips, residence hall habits (Example: "I don't always use the dorm bathrooms, but when I do, I leave the seat down and piss all over it. "), and the ginormous cost of higher education (one repeatedly shared example below). In addition, they occasionally riff on more serious issues and sacred campus cows. As The Triangle at Drexel University confirmed about memes targeting the Philadelphia school, "[N]ot all of them are simple jokes. Many of them voice legitimate concerns of Drexel students ... One of the most popular image macros, with over 400 likes in just two days, features the image of the A.J. Drexel statue and the caption 'Congratulations on your acceptance -- to a construction zone.'" Similarly, according to The Daily Universe, the Brigham Young University memes page "has exploded into an online forum of Mormon and BYU culture parodies, which are sure to entertain anyone familiar with the Mormon culture." For example, a recent meme humorously spun one of Christianity's most repeated, revered lessons. It presented an image of Jesus sitting before worshipers, saying simply, "So I was like, 'Bro, do you want someone to do that to you? Well, then don't do it to them.'" The actual Golden Rule is of course phrased a bit more formally: Do unto others as you would have them do unto you. It applies directly to college memes. Students who mock others with a meme will be mocked with memes themselves. Students who screw up a meme will quickly see correction memes posted in response (Example: "You keep using that picture ... I don't think it memes what you think it memes."). And, in a full embrace of the self-aware era, there are also scores of memes commenting on students wasting their time reading or generating memes. Last week, a pair of University of Oregon freshmen launched a memes page dedicated to "images lampooning college life" at the Pac-12 school. It took off, within minutes, and has continued to spread, non-stop. On its first day in action, the page roped in roughly 2,500 likes. 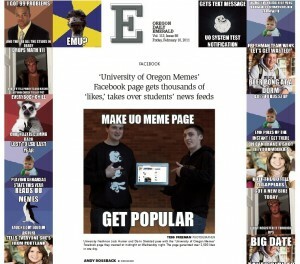 On day two, University of Oregon Memes was on the front page of The Daily Emerald student newspaper. The start of the related story succinctly summarizes the phenomenon at-large, noting, "When University freshmen Jack Hunter and Darin Shelstad created a Facebook page late Wednesday night to share inside jokes, they never expected it would become so popular. But it did. Overnight. Literally." Around the same time, a sophomore memes page creator at Boston University told The Daily Free Press, "Overnight, it just went into a snowball effect and became the success it is now. I haven't had time to get actual work done amidst all this fun." He said this less than 72 hours after creating the page. 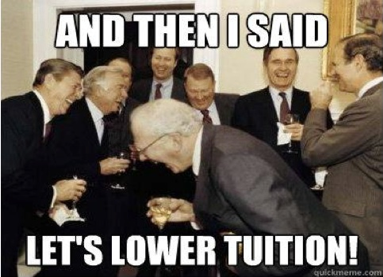 BU Memes currently sports roughly 6,500 likes. Since the start of many pages last week, there has been a flash-bang surge in likes, comments, shares, and user-submitted entries. This wave of attention and feedback is either launching the Internet meme into the college media mainstream or setting it up as a "wonderful concept that will probably be bastardized into the ground in a few weeks," as The Hook Up stated. The most vociferous meme enemies are those already annoyed at the image-and-text configurations increasingly crowding their Facebook feeds. "Last night, our Facebook timelines were flooded by a wave of memes," an NYU Local report at New York University noted. "Initially, these image macros were a welcome distraction from looming homework assignments: they were just funny enough to keep us reading, and they provided a comforting feeling of community and togetherness. 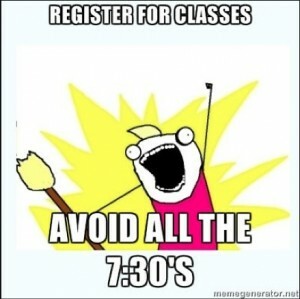 That said, the [NYU memes page] quickly spiraled out of control. Students posted hundreds of memes, and only a select few were in the least bit funny." Separate complainants in the "meme police" category accuse clueless students of distorting the meme's original higher-minded purpose -- in part, to be a serious carrier of significant cultural ideas -- to the point of mockery. More lightheartedly, some readers are expressing faux-outrage at how addictive the memes are to scroll through, read, comment upon, and create. As a student wrote about UO Memes, "This page is going to kill my GPA." Dan Reimold is an assistant professor of journalism at the University of Tampa. He writes and presents frequently on the campus press and maintains the student journalism industry blog College Media Matters, affiliated with the Associated Collegiate Press.